Palestinian militant group Hamas has released a video showing two Britons it says it used for a suicide bombing a year ago. Londoner Asif Hanif, 21, killed three people and injured 55 by blowing himself up in Tel Aviv, last April. Omar Khan Sharif, 27, of Derby, is thought to have fled after explosives strapped to his body failed. The Israeli government said the Britons were part of a "terrorists' war" being waged by Hamas on Israel. 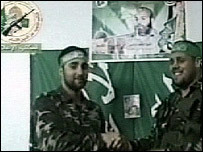 Hamas released the video on Monday to mark the first anniversary of the killing of leader Ibrahim al-Maqadma. One of the Islamist organisation's military leaders and founders, Maqadma died in an Israeli helicopter missile attack on a car in Gaza city. 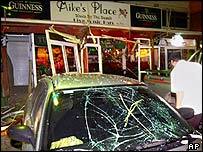 Hanif blew himself up in a beachfront pub called Mike's Place, and Sharif's body was later found washed up on an Israeli beach. It is the first time a suicide bomber has recorded a video, explaining his motivation in detail. Usually, bombers read a few verses from the Koran. In the video, released on Monday, the pair are shown brandishing assault rifles and calling on God to punish UK Prime Minister Tony Blair and US President George W Bush. In a statement released with the video, Hamas's military wing said the bombing had been a message to Israel that the group "has many options to fight against you as long as you are occupying our land and committing massacres against our people". And it called Maqadma an international figure whose death merited an international response. Israeli government spokesman Raanan Gissin told BBC News Hamas was now an international organisation "sending its tentacles into Israel" to wage war. Hanif and Sharif were part of this war's "terrorist expeditionary forces", he added. "In the face of this unmitigated terror campaign, we have every right to exercise our right of self-defence and to carry the war to the doorsteps of these terrorists," Mr Gissin told BBC News. In the video, Sharif delivers a tirade in English against Israel. He says: "Muslims are being killed everyday. It is an honour to kill one of those people [Jews]." Hanif, from Hounslow, west London, calls on Muslims everywhere to be "people of action". Sharif, who was married, says he visited a farm destroyed during an Israeli incursion in the northern Gaza town of Beit Lahia. He asked: "What are we doing, as Muslims, to help?" Hanif delivers a traditional speech of Koranic verses, and the men pray in a Gaza flat. Shuli Davidovich, spokeswoman for the Israeli Embassy in London, said the men had used their British passports to kill Israelis. And she added the recruitment of foreigners showed the need for an international campaign against terrorism. The video's release comes a day after Israeli troops killed 14 Palestinians in a raid of a Gaza Strip refugee camp, including 10 militants and four children under the age of 16. The Israeli army described the incursion as a "pinpoint operation against the terrorist infrastructure in the central Gaza Strip". The governor of central Gaza, Abdallah Abu Samhadama, called the raid "a big massacre against our people".